Ramps bring a mild, wild onion flavor for a unique twist to this pesto recipe. Author: John "from the Bartolini kitchens"
Prepare the ramps: Wash and thoroughly dry the leaves. Trim away the bottom roots of each bulb, much like you do with spring onions/scallions. Cut off and roughly chop each ramp bulb, then roughly cut or hand tear the leaves and stems. Add the bulbs and walnuts to a food processor. Process until a thick paste develops, about a minute. Be sure to scrape down the sides of the bowl midway through. Add the ramp leaves, cheese, salt, and pepper to the food processor bowl. Process until evenly combined. 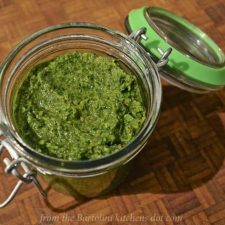 I prefer my pesto to be a thick paste, so, I don’t add much oil to the processor. When it’s time to dress the pasta, I’ll first coat the pasta with a little olive oil and then add the pesto. I find that a paste, also, works better when using pesto in other ways, like seasoning roasted chicken.